Daft Punk, Lorde And Macklemore Win Major Grammy Awards : The Record Daft Punk picked up trophies for album and record of the year, Lorde won two awards for "Royals," and Macklemore and Ryan Lewis took home four, including Best New Artist. 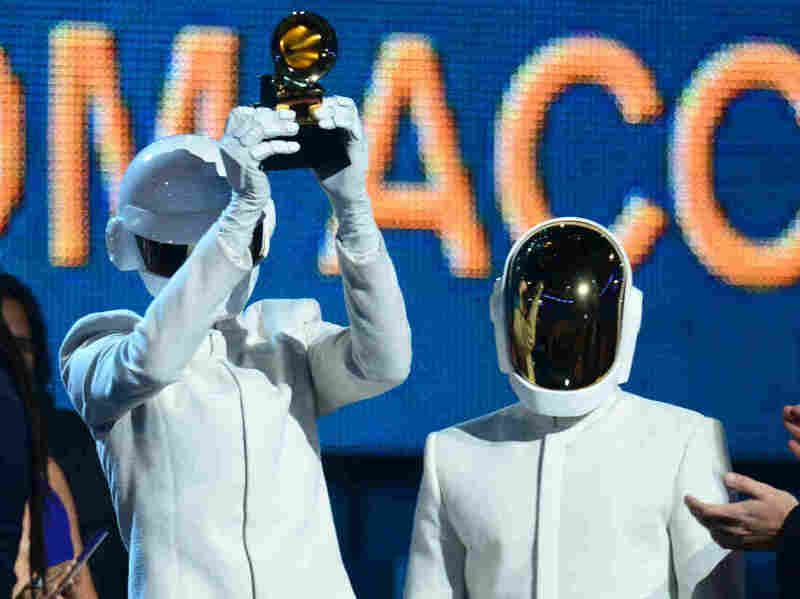 Daft Punk won the Grammy for Album of the Year for Random Access Memories and for Record of the Year for "Get Lucky." French dance music producers Daft Punk won Album of the Year for Random Access Memories and Record of the Year for their hit "Get Lucky" at the 56th annual Grammy awards on Sunday night. In a ceremony heavy on collaborative performances (Robin Thicke with Chicago, Kendrick Lamar with Imagine Dragons and Metallica with Lang Lang were a few of the more random pairings) and light on surprise, no single artist dominated. Williams, who acted as Daft Punk's main spokesman for most of the night, was nominated for seven awards and won four, including Producer of the Year, Non-Classical. The three he lost (for producing Robin Thicke's Record and Pop Duo/Group nominee "Blurred Lines" and Kendrick Lamar's Album nominee good kid m.A.A.d city) were also awards he won. The chart-topping Seattle-based hip-hop duo Macklemore and Ryan Lewis also won four Grammys, including Best New Artist and three rap awards. New Zealand's Lorde won the other major award, Song of the Year, as well as Best Pop Solo Performance, for "Royals," which dominated the singles chart for two months in the fall. Other multiple award winners included country newcomer Kacey Musgraves, R&B and rap collaborators Justin Timberlake and Jay Z, gospel singer Ty Tribbett and classical composer Maria Schneider. Schneider was among the winners announced at a ceremony before the night's main event, where, as NPR's Mandalit Del Barco reported on Morning Edition, most of this year's 82 awards were handed out. That spotlight, however comparably dim, still meant something huge to those who picked up Grammys. "Most of us who are coming through here that you're seeing this afternoon, we're funding our own records," Schneider said back stage. Listen to Mandalit Del Barco's report at the audio link on this page. The complete list of Grammy winners is below. Best Traditional R&B Performance – "Please Come Home" by Gary Clark Jr.